The Five Points Community Pride Association focuses on building a strong community with vibrant neighborhoods and businesses. 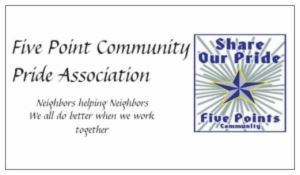 The Five Points Community Pride Association has been busy garnering the assistance of area businesses to offer both financial and in-kind support of Association activities, as well as listen to the voice of residents concerning products and services they'd like to locally access. The Association meeting times are not set. Scheduled meetings are held at the Washington Terrace Recreation Center at 101 Gordon Street. The boundaries of the Five Points Community Pride Association are Montlieu Avenue to the south, Greensboro Road to the east, Suffolk Avenue to the north and McGuinn to the west.